Holbeck sorting office to close? 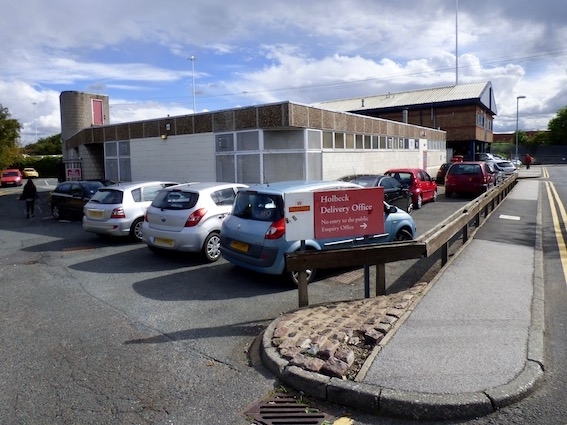 The Royal Mail announced yesterday (13 September 2017) plans to close the Holbeck Delivery Office on New Princess Street and move operations to the Leeds City Mail Processing Unit (MPU) on an industrial estate off Wellington Bridge near the Armley Gyratory. Royal Mail, which was privatised in 2013, says the move “will improve facilities for our customers in the LS11 postcode area” and that there would be no impact on deliveries in the area. There will be a 12 week consultation period before a decision is taken. The move is part of the company’s ongoing transformation of its business to increase the efficiency of its operation as well as providing delivery offices which are fit for purpose for staff and customers. The Wellington Bridge site will also have car parking for customers and offer extended opening hours. Royal Mail says it is responding to the huge growth in electronic communications and decline in letter volumes, while seeing a high volume of parcels and online shopping which need to be delivered to customers. “Speaking from a personal standpoint I don’t believe that it would be in the public’s best interest as it would cause problems regarding ease of access to the public should they need to collect parcels etc. Royal Mail point out they can now leave many mail items with a neighbour if customers are not at home when they attempt delivery. Customers can nominate a dedicated neighbour to take in their parcels by filling in a form at their delivery office. Customers can also arrange a redelivery free of charge on a day that is convenient for them (including Saturdays), or Royal Mail can deliver the item to a different address within the same postcode area. This service can be arranged by calling the number on the “Something for You” card, or by visiting the website at www.royalmail.com/redelivery. There are not expected to be any job losses if the move goes ahead. Leeds City MPU is located at, Unit 2 Wellington Bridge, Leeds, LS12 2UA, 1.9 miles away from the Holbeck Delivery Office. What do you think? Would moving the office cause you difficulties? Please add your comments below. For those living in the Garnetts/Longroyds and using public transport to the new site, it’s probably quicker and safer going to the Stourton sorting office because you’ve only got one direct bus every half hour at the most to the new site, and that still involves a walk from the nearest stop over the Gyratory and along Wellington Road, not really something you should be doing with valuables! Travelling via Leeds may mean you have more buses to choose from, but you’ve still got to either walk from Leeds to Wellington Bridge, which I’m guessing is a good half hour from where the Corn Exchange buses drop off at, or mess about changing buses in Leeds, and that’s not great if your bus doesn’t stop near the connecting bus. Walking to Low Road Hunslet from Garnetts/Longroyds probably takes 12 to 20 minutes depending on where you live and you can catch frequent services (189/167/168/410) to Stourton sorting office about another 10 to 15 minutes away. Much quicker than travelling to Wellington Road. Or move and be even more awkward to get to OR start automatic redelivery again. I do not think this office should be closed I regularly have packages sent to this office which is convenient and handy. I would not want to travel further to get them. The redelivery service is not always suitable for me as I work full time and I’m out on a sat day time.. There will also be cost implications for people in the local area who don’t drive. 12 weeks consultation on a decision that has already been made, what a joke Royal Mail is. How can you improve a service for the people of LS11 by moving the sorting office further away? People like myself who have their mail held for collection and have no transport are being royally stuffed by this decision. If was possible I would stop getting anything delivered by Royal Mail but unfortunately some things cannot come by email.